Fresh from an internship in brand marketing in Tel Aviv this summer, Mason Williams recounts her experience. 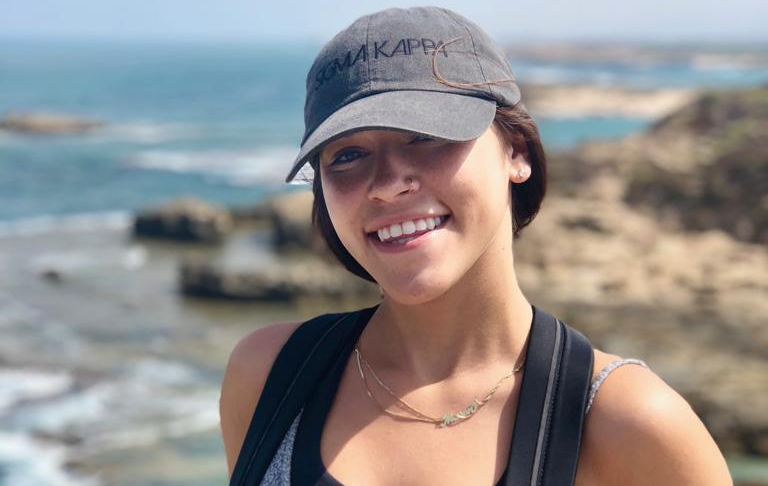 She is one of 22 college students who were part of Onward Israel, a program that places Jewish students in summer internships in their respective fields in Israel. Williams recently graduated from Ohio University, where she majored in Psychology and minored in Retail Merchandising and Fashion Product Development. Her internship placement was at Preen.Me, a community-based product and brand discovery agency. Williams quickly got comfortable. She and the other interns hit it off, and within days, settled into their internships and life in Tel Aviv. In addition to their everyday work, Onward Israel participants spent a lot of time at the beach and had the opportunity to travel. One weekend the group visited Netanya, Cincinnati’s partnership city. “When we arrived in Netanya, we were welcomed at a community center by members of the Cincinnati-Netanya Partnership2Gether Steering Committee and students from Netanya,” Williams said. “The students were about 14 or 15 years old, and we got to have breakfast with them. We heard about their daily lives and discovered cultural differences between growing up in the United States and growing up in Israel. “Once we finished breakfast, we met our host families. Each of us, some in pairs, stayed with a host family in Netanya instead of at a hotel. This way, the group got to learn more about what it was like to actually live in Israel instead of just visit. After eight weeks, the group ended its time together with one last Shabbat dinner in Tel Aviv. Days later, the Cincinnati delegation packed their bags and returned home. While some headed back to school, others began the search for their first job out of college. All of them were glad for the experience. “I had the most amazing summer, and I’m so thankful for the Onward Israel program,” said Reagan Heck, a junior at Miami. She interned at a small company called Windows, whose goal is to spread awareness about and share the history of the Israeli-Palestinian conflict. “I have learned many valuable skills from my internship, and I am super excited to apply them to my studies in business school in the coming years,” said Bradley Bolotin, a sophomore at Indiana University. He interned at Casaversa, a home-swapping startup company in Tel Aviv that helps people travel with zero accommodation cost. “Leaving was bittersweet to say the least,” Williams said. “While at times we all missed Cincinnati, and of course our beloved Skyline Chili, we truly loved spending our summer in Israel. It went by so fast. Onward Israel is administered by JVS Career Services. Cincy Journeys post high school Israel travel grants are administered by the Jewish Federation of Cincinnati and funded by The Jewish Foundation of Cincinnati. Portions of the article were written by Onward Israel blogger Mason Williams. To read more of her features about their internships this summer, visit cincyinternships.org.